Did anyone not see this news coming? Sure, Angry Birds may have cost the U.S. economy roughly $1.5 billion last year, but it's also made developer Rovio enough money to get into the movie business and create a real-life Angry Birds level. Now, it turns out that the company is getting ready to set up its own indie publishing label that will put out (what else) addictive mobile titles. Following up on rumors that the Finnish studio would be launching its own publishing group in the near future, Develop approached Rovio about these reports. 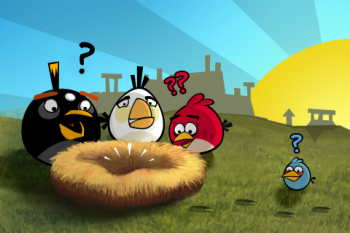 Rovio neither confirmed nor denied the claims. Instead, the company's "Mighty Eagle" (side note: is that not the greatest job title ever or what?) Peter Vasterbacka nebulously stated, "We have some plans for this area, but not ready to announce yet. If we do something in the publishing area, you can expect it to be a bit different." Let's be honest about this: Rovio is obviously going to get involved with game publishing eventually, it's just a matter of when it'll happen. The only question is if the company will produce tie-in plush toys for the other games it publishes.